'English Majors and Earning Po..
A new public television documentary featuring an MTSU professor’s insights on an early 20th-century piano company-turned record company was the topic of a recent edition of the “MTSU On the Record” radio program. Host Gina Logue’s interview with Charlie Dahan, a professor in MTSU’s Department of Recording Industry, first aired Dec. 11 on WMOT-FM Roots Radio 89.5 and online at www.wmot.org. You can listen to their conversation above. Bloomington, Indiana, public television station WTIU spoke with Dahan for its documentary, “The Music Makers of Gennett Records,” which tells the story of the Richmond, Indiana, piano factory that branched into recording to enhance its profits. In launching a recording studio to make the music of underrepresented groups more readily available to the masses, Gennett gave a platform to some of the most influential American musicians of the 20th century, including King Oliver, Louis Armstrong, Bix Beiderbecke, Hoagy Carmichael, Jelly Roll Morton, Uncle Dave Macon, Gene Autry and Duke Ellington. Dahan, co-author of “Gennett Records and Starr Piano” with Linda Gennett Irmscher, said Gennett opened its doors to blues, gospel, country and jazz artists because its founders realized they couldn’t compete with the pop artists signed to the Columbia and Victor labels. 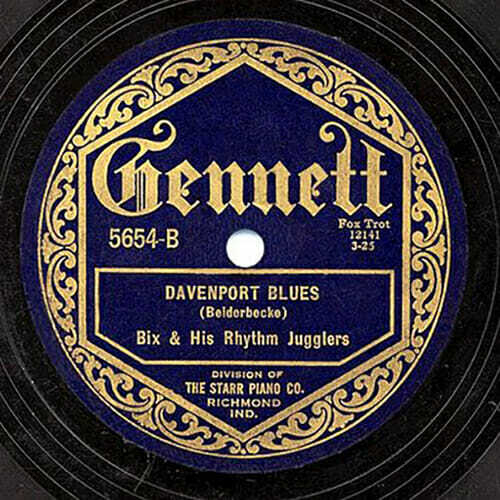 Gennett Records, the label created by the Indiana-based Starr Piano Co., captured this 78 rpm recording of “Davenport Blues,” written and performed by jazz great Bix Beiderbecke, in 1925. MTSU recording industry professor Charlie Dahan discussed the Gennett Records story on the Dec. 11 edition of “MTSU On the Record” on WMOT-FM Roots Radio 89.5. Others who spoke with the documentarians for “The Music Makers of Gennett Records” include gospel legend Bobby Jones, Country Music Hall of Fame member Ricky Skaggs, jazz master Wynton Marsalis and Hoagy Bix Carmichael, son of the late Hoagy Carmichael. You can watch the documentary free through the end of December 2018 at https://indianapublicmedia.org/gennett. Watch a preview below.